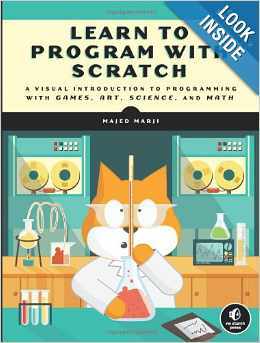 This newly released book from No Starch Press ups the ante on Scratch programming for kids and adults. When Scratch first came out a few years ago, Scratch books used examples that were fairly easy. Now that Scratch has an enthusiastic following, books that delve deeper into Scratch are appearing on the scene. Majed Marji, the author of this book, holds a PhD in electrical engineering and works for General Motors. He is an outstanding explainer. What endears me to this book is that some of the Scratch examples he uses are learning games. For me, that conjures up happy days in my life when I designed educational games using Applesoft BASIC on Apple II computers. Youth can learn programming skills creating games that have real world educational value. We should not assume that children only want to create video games whose educational value is slim. As a STEM enthusiast, I also loved seeing the Scratch programs that use high school level math for drawing spirograph types of patterns, such as roses and sunflowers. If the math teachers at your school haven’t taken a look at Scratch, a free learning tool, they need to get on the ball. It should be noted that this new book cover Scratch 2.0, with its expanded capabilities. When Scratch 2.0 came out a few months ago, it was a web-based only tool. Thankfully, an offline Scratch 2.0 editor is now available. This makes Scratch 2.0 available to families who don’t have Internet access at home. Organizations and individuals who refurbish computers for these families are strongly recommended to include Scratch on computers that are going to these homes. This book is a recommended purchase for school and public libraries, as well as makerspaces. I’ll be sharing it with the leaders of the local CoderDojo programming club, as well as with Maker Kidz, a local mobile makerspace forming in Annapolis, Maryland. Kudos to the author of this book and to No Starch press for their high standards. Your caring for producing high quality books really shows.